High magnification reveals new worlds hiding in everyday objects. 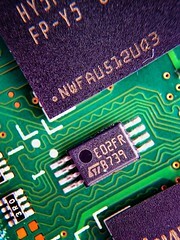 I've been photographing old RAM chips with the olloclip Macro 3-IN-1 Photo Lens and the olloclip Quick-Flip Case + Pro-Photo Adapter. Using the InstaFocus Hood that's included with the kit, both lighting and focusing are easy. 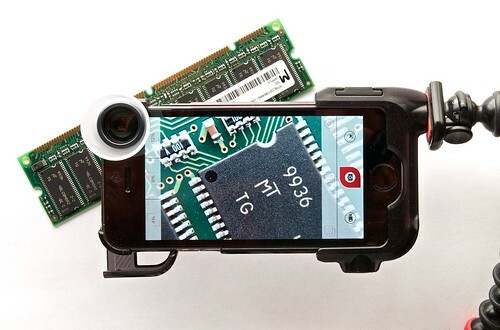 Just attach the hood to the lens and set it on the object you want to photograph. Tap on the iPhone screen, and the image snaps into clarity. I recommend using the olloclip app available in the iTunes App Store to capture the image. Not only is it designed to work with the lenses, it also features a Mesh Editor Tool that makes distortion correction easy before saving the picture to your Camera Roll. The iPhone 5S with olloclip lens and case and Joby Gorillapod for additional support. Photos by Derrick Story. You can learn more about the olloclip Macro at their site. It's available for $69.99 directly from olloclip or from Amazon. The olloclip has a high Nimbleosity Rating. What does that mean? You can learn about Nimbleosity and more by visiting TheNimblePhotographer.com.